Look for my trips and tips on Family Travel site Trekaroo! 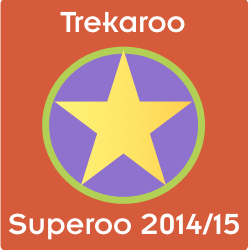 Trekaroo, the fantastic family travel website, announced new Superoos for 2014 & 2015. Superoo is the kid-friendly term for their handpicked crew of the most adventurous & travel savvy contributors–and I’m one of them! Trekaroo’s Superoo Council has handpicked you for this award in recognition of the fantastic contributions you’ve made to the Trekaroo community this past year. This is a badge of honor we give only to our most valuable members. Visit my Trekaroo Passport to view some of the reviews & photos that garnered this attention &the Superoo Award. Over half of my reviews were first-time additions to the site! They include Mountain Biking Trails, Nat’l & State Parks and family-friendly hotels, eateries & quiet spots around the Southeast US. For your entertainment, here is one of my early reviews easily found on my Trekaroo Passport! This place is a scene straight out of Gordon Ramsay’s Kitchen Nightmares. I swear… if you think that show is fake, eating at this restaurant will prove to you it is not. This has got to be the worst dining experience in my entire life. It is an extremely odd atmosphere. The food is terrible. You are better off eating beans out of a can than ordering at this place. The first dish they served me looked like greenish-yellowish meat… BLECH! I turned it down, ordered something else and that came out equally as nasty. My son ordered a grilled cheese sandwich… Grilled Cheese!!! They couldn’t even cook that right. We tried this place because we were staying at the Days Inn that is attached to it. But, it is a horrible, horrible mistake. My greatest thanks to Destination Guroo, Friend Extraordinaire & Supreme Being, Lesli Peterson, author of 365 Atlanta Family and the Trekaroo Community. Use twitter to follow along @LongLiveLearnin and @Trekaroo as we embark on this new adventure of expanding our horizons. Congrats Candy on your award, well deserved! You are always knowledgeable when it comes to travel! And OMG….what restaurant was that you went to? I need to make sure to never go there!!!!!!! Louida, thank you so much. And, the restaurant in the review is “City Cafe Diner” in Chattanooga, TN. It is attached to the Days Inn. Trekaroo is lucky to have you!